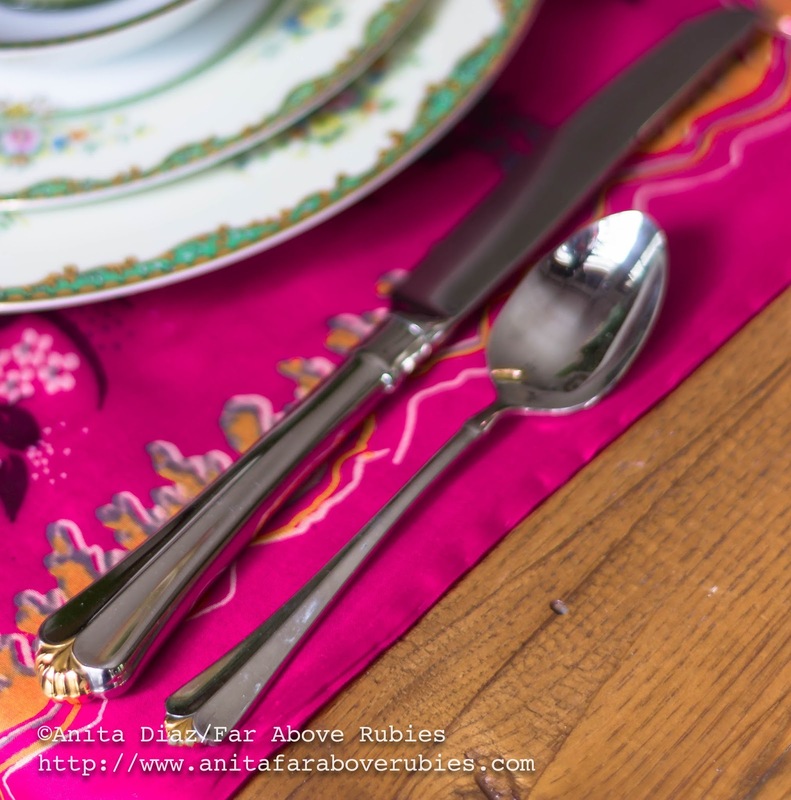 As I promised last week, I decided to play around with the dishes and set some pretty tables, because I had seriously been neglecting that part of my blog. I love to use a lot of the same elements and change up the looks with a few different things, so that's exactly what I did this week. I used the same runner I made from a vintage silk sari, pink napkins and orchid centerpiece from my Blue Willow table last week, and added different dinnerware, glassware, flatware and placemats. I love this Noritake "Condoro" from the 1930s that my mom and I share. (She used it for a gorgeous bridal table a couple years ago.) 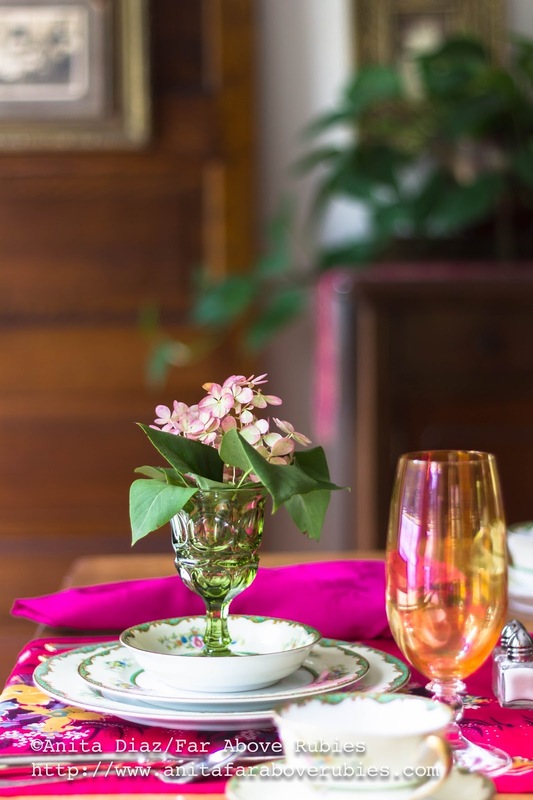 It is porcelain, which I love, and the delicate floral pattern just goes with anything. 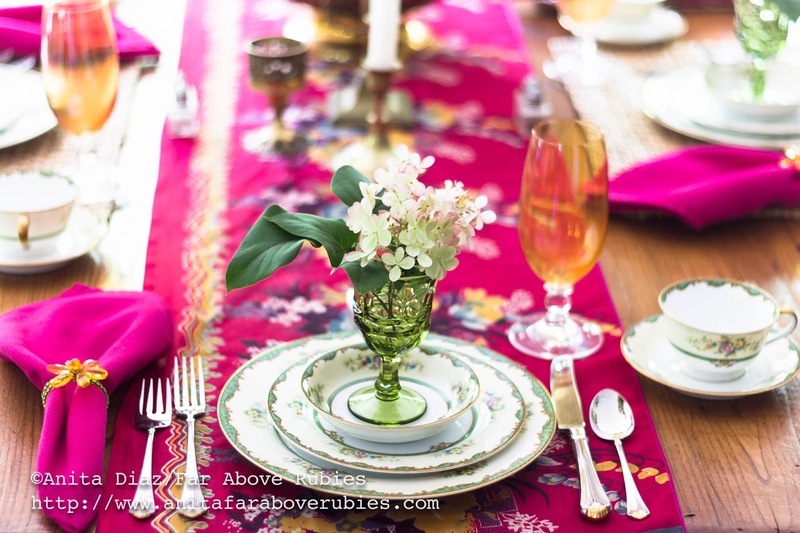 This is not normally a color combination I would try, especially with such a traditional pattern, but all these colors just work so well together and really give this table a collected and current look. I really think the color combination is what makes this table modern and fun. I used the Oneida "Golden Julliard" flatware with just a hint of gold on the handles to coordinate with the gold rim on the china and the other brass accents on the table. 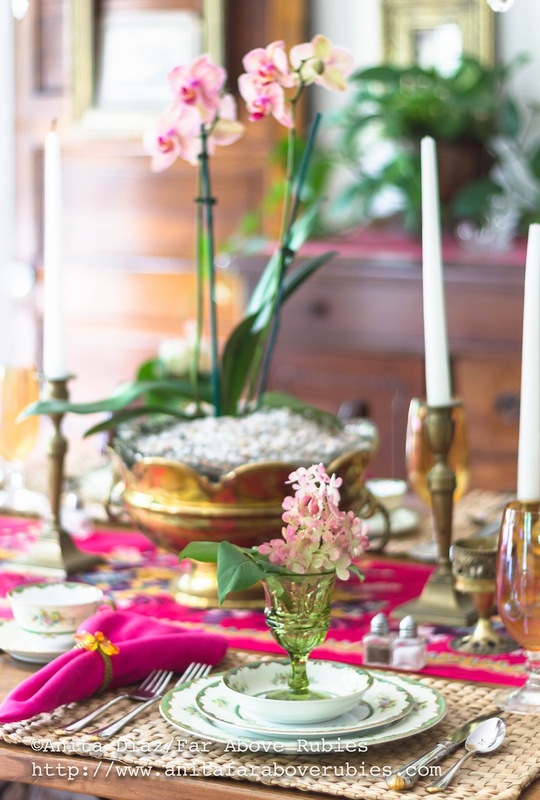 In flatware, a little bit of gold goes a long way with me, and this adds just the right touch. I pulled out the April Cornell beaded napkin rings I bought a few years ago to keep the floral theme going and to coordinate with the Pier 1 iridescent amber glassware. I kept the orchid centerpiece and added some of my vanilla strawberry hydrangea blooms with lilac leaves in a Fostoria "Argus" cordial. I love how the colors in the orchid blooms and the hydrangeas are almost identical. The addition of the flowers at each setting is what really makes this table special. This is such an easy thing to do with punch cups or whatever small containers you have on hand, and really makes a big impact. 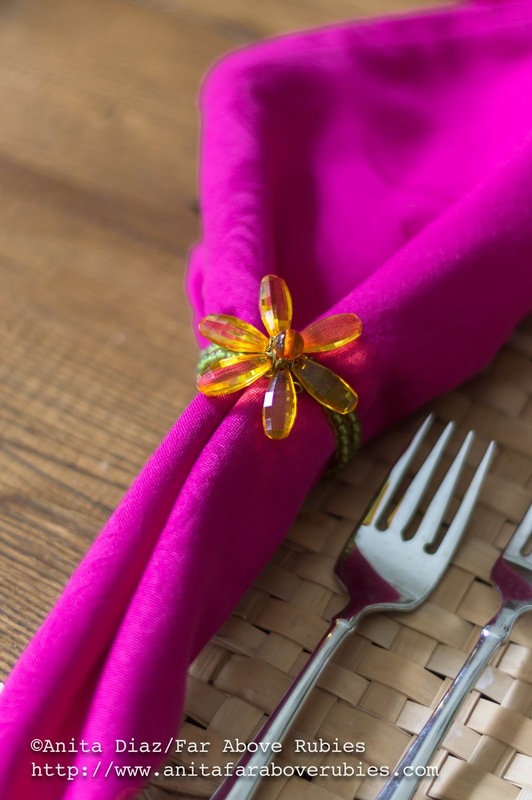 The woven placemats are from Crate and Barrel and were gifted to me by my sweet Aunt Jody who also loves pretty tables:-) I always add organic and textural elements to my tables because I think it keeps them from looking too stuffy -- which can happen with matched sets of dinnerware. Of course, the addition of candle light gives everything a soft glow. 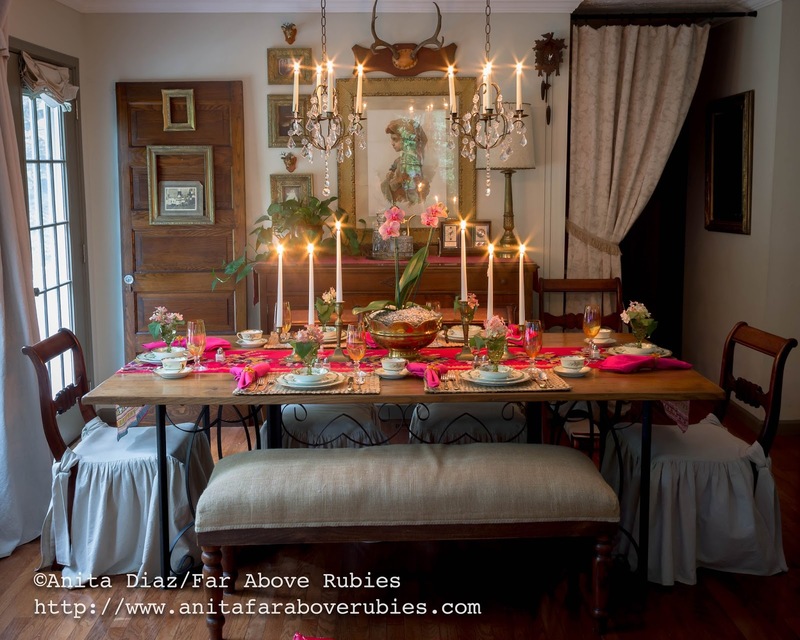 Such a gorgeous tablescape, Anita! Anita, it looks amazing! I so love your pink!! Oh that china! My heart be still. It has everything I adore. What a perfect tablescape. Your china is so beautiful! I just love it. You have done such a wonderful job combining it with these bright elements. 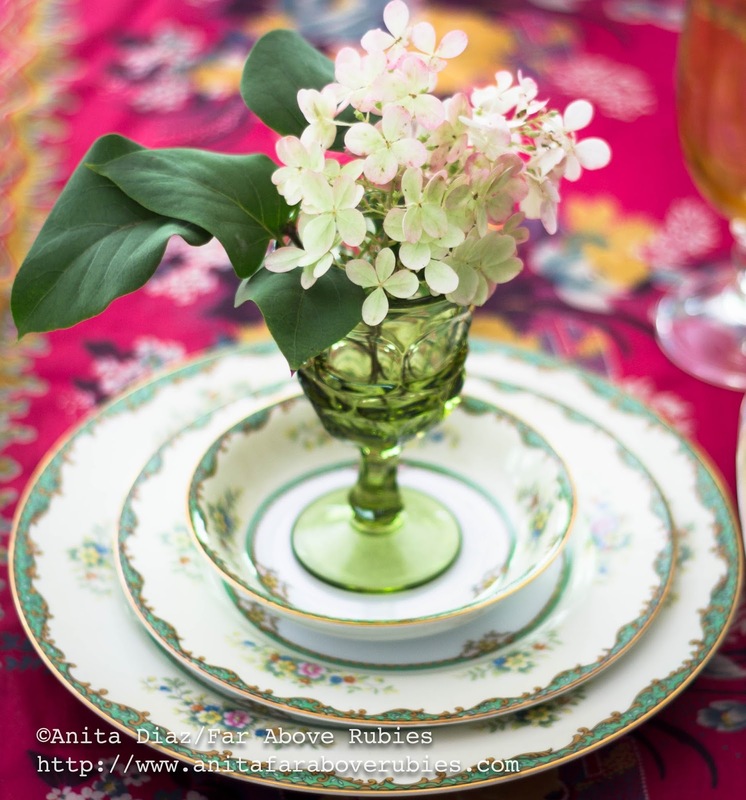 I am timid trying to mix vintage china with bold color. This is very inspiring! 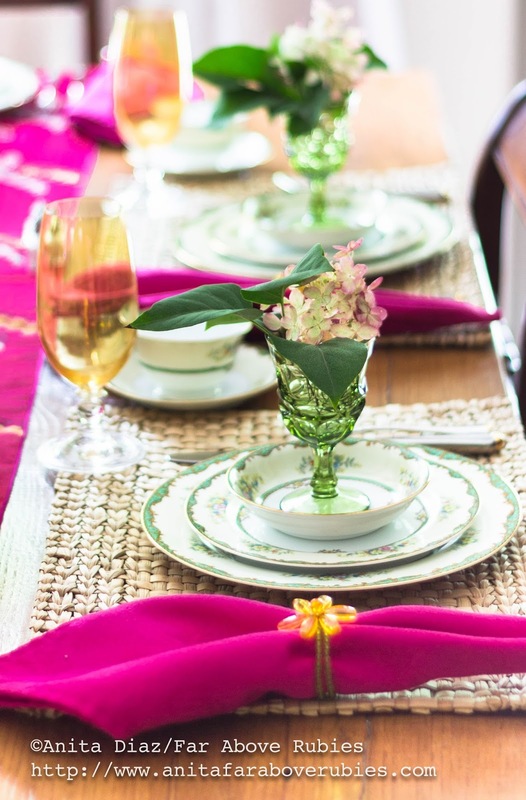 You are so lucky to share this love of dishes with your mother and your aunt. Gorgeous colorful combination! The bright pink is lovely with the china pattern! 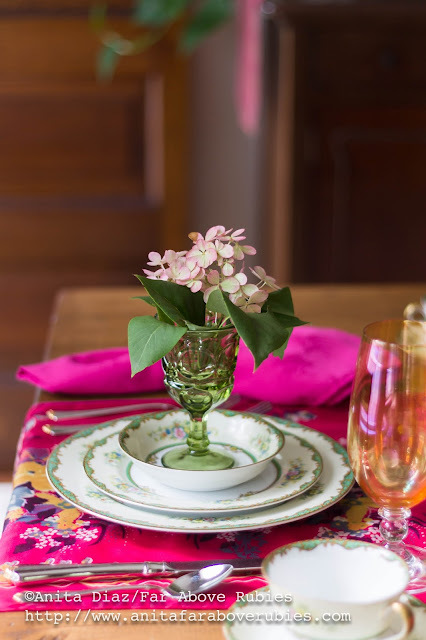 The green cordial with the blossom is a great idea to bring hues and height to each place setting! 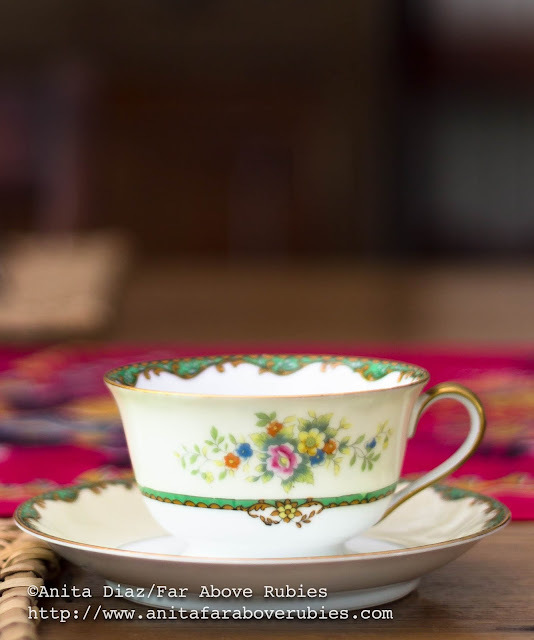 Please take a peek of my post this week! Your style is to die for!